Waiting for the results of that make-or-break exam you took last week. Waiting in line for that white chocolate mocha at Starbucks you ordered five long minutes ago. Waiting for that phone call or text reply to come. We always seem to be waiting. It's a part of life. When the wait for one thing ends, we seem to quickly move on to something else to wait for. A job offer. A romantic relationship. A big break. In a society where we are quickly getting used to getting what we want, when we want it (usually, that's right now! 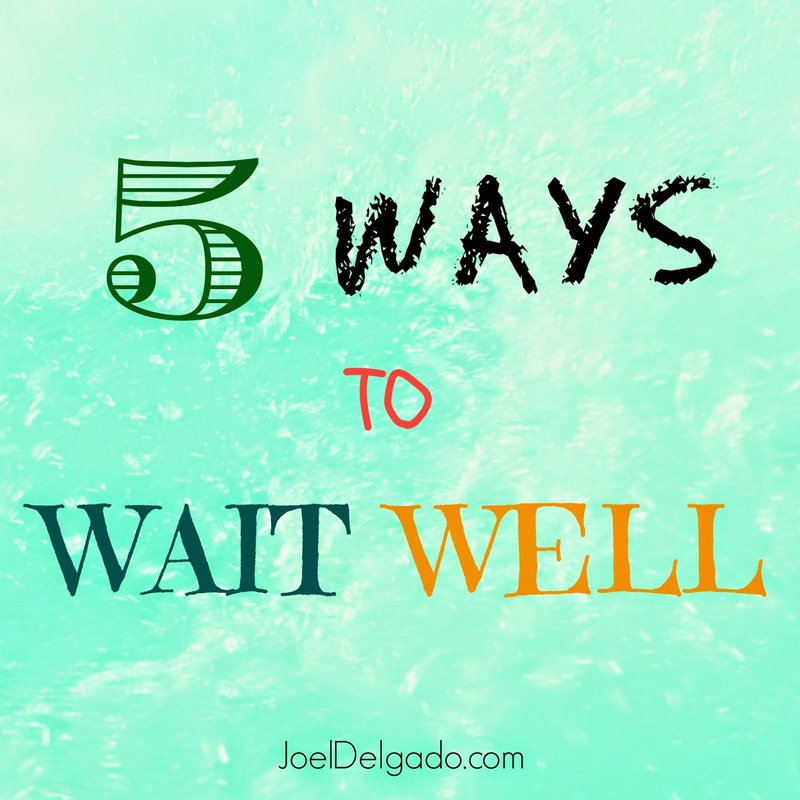 ), waiting can be as frustrating as watching a soccer game that ultimately ends in a scoreless draw. But there is value in waiting, because it builds patience. And patience -- the capacity and willingness to endure all things -- helps turn a passive twiddling of our thumbs into a meaningful, purposeful waiting period. Patience isn't about what you are waiting for, but how you are waiting for it. It’s about waiting well. When King David wrote Psalm 27:14, I feel like he was writing specifically to those of us stuck in the waiting room of life, waiting for a yes. Or a no. Or just any answer at all. He writes: "Wait for the Lord; be strong and courageous. Wait for the Lord." David knew a thing or two about waiting. Even after Samuel appointed him king of Israel, David didn’t immediately go slay Goliath. Saul was not promptly impeached and David sworn in. David had to wait. Before he could rise to his calling to become king in the future, he had to fulfill his responsibilities -- as a shepherd -- in the present. And so do we. Pour out your heart to God. Bring your fears and doubts along with your desires and dreams to Him. He knows and wants you to trust Him with everything you’re waiting and asking for. Then be still and listen. Sometimes we get so eager to make something happen that we forget to listen to God for direction. Spend time with Him in prayer, listening for His instruction and seeking His counsel in every situation. Always remember the things God has already pulled you through and give Him all the praise and all the glory for those victories. Recalling those triumphant moments not only renews our faith in who God is, but provides hope and courage in present situations. Stop focusing on what you don't have and be thankful for what you've already been blessed with. Nothing brings more joy in the present and in the midst of waiting than a content and grateful heart. If you signed up today for a marathon that is taking place a few months from now, hopefully you're not going to just sit around and do nothing in the meantime. If you're smart, you start preparing now. You get up a little earlier than usual. You train. You eat smarter. You build up strength and endurance and stamina, so that when the day of the race finally arrives, you're ready to go! What can you do right now to prepare for what God is already preparing for you? What is God trying to teach you now while you’re waiting? Like trying to take in the surrounding landscape while riding a roller coaster, many times our perception of a situation is not clear. Everything seems topsy-turvy when life is moving a hundred miles per hour and we’re right in the middle of it. We need to take a step back and take a look at the bigger picture. We need to take a step back and take a look at the bigger picture. It's not about what we think will satisfy us now, but what God wants to do in us, for us and through us later. When we remember that immediate gratification is not the goal and God has our greater interests at heart, we can faithfully continue to wait and trust Him. Keep moving ahead. There are things to be done right now. Opportunities to grow, serve and learn are always right in front of us, but we can easily miss them if we're constantly worrying about tomorrow. How can you grow where you stand right now? It’s in the season of waiting where character is forged and refined. It’s where we learn new skills, discover what we’re passionate (and not passionate) about. Don’t waste your wait.